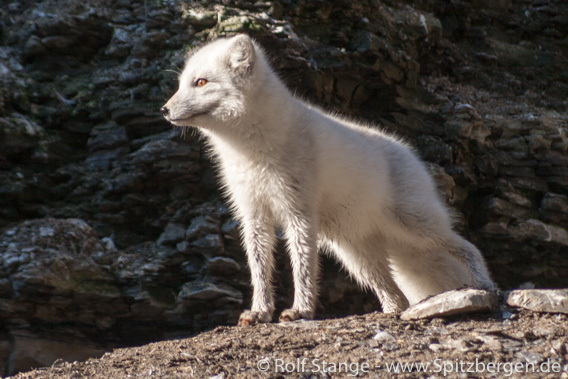 A polar fox was found to have rabies after having attacked dogs on the little island Hopen in southeast Svalbard, according to a note by the Sysselmannen. The fox attacked the dogs which belong to the weather station Hopen Meteo on 26 April; it was killed by the dogs during the attack. Routinely, the fox was taken to Oslo, where it was found to be infected by rabies. Hopen is in the far southeast of Svalbard, 90 kilometres away from Edgeøya, the next large island, 200 kilometres from Spitsbergen’s east coast and almost 300 kilometres from Longyearbyen. It is, however, easily possible that other, infected polar foxes are already further west, where the settlements are located and tourists have their more common routes, or they may cover these distances quickly: most sea areas in the east of the Spitsbergen archipelago are still covered by dense drift ice, where polar foxes are known to travel large areas. It is very likely that the rabies virus came with a polar fox from arctic Russia, further away from Hopen than the main island of Spitsbergen. This is not the first time rabies is found in Svalbard; on the long term, it happens actually more or less regularly: the virus has been found no less than 7 times since 1980, including the recent incident on Hopen. The last time was in 2011, when rabies was found in reindeer and foxes on Hopen, in Hornsund and near Longyearbyen. Polar fox on Edgeøya: curiosity is normal behaviour, aggression in contrast an alarm signal for rabies. Unusual behaviour of polar foxes including aggression towards humans or larger animals is a clear warning sign of a rabies infection. The actual risk of infections for humans is very low and the recent episode does certainly not involve any general risk for travelling in Svalbard, but awareness of the situation is, as always, important.